Until now, there has been nothing significant written about struggles endured by families in and around Sheboygan, Wisconsin during the 1954 Kohler Strike, the longest and most violent strike in American industrial history. This book follows Ann Edwards, daughter of a prominent Kohler striker. 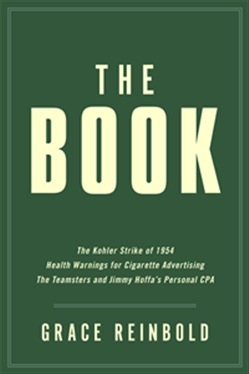 Elliott Goldberg was personal CPA for Jimmy Hoffa and The Teamsters in Michigan and Washington D.C., during the turbulent Hoffa years between 1946 and 1962. As part of his job description, Elliott made payoffs to American presidential hopefuls and other political leaders. Private planes crash and kill union presidents, pilots and the political money messengers who were on board. Hoffa disappeared in 1975, within two weeks of the FBI announcement about missing union pension fund money; $250,000,000.00. Elliott worked with union pension funds, on behalf of Hoffa. Ann was endowed with natural public relations and marketing skills that helped her husband Eddie rise to success by managing his career; he became a famous hypnotist with a nationwide business that helped people stop smoking and lose weight. Their achievements as husband and wife provide a fascinating public and social matrix. They enjoy a glamorous society life in Lansing, the capital of Michigan. Ann becomes an activist for anti-smoking and appears on numerous Radio and Television programs including ABC's "20/20," a national network news program. The tobacco industry retaliates. Stress got the best of Eddie and Ann; they divorce after twenty-five years of marriage. Both re-marry. She marries a British road manager for a top recording group and the two of them move to Nashville, Tennessee where she becomes a successful music executive. Before long, she and her road manager husband go their separate ways. Elliott gives to Ann a collection of his explosive essays about the years he worked for Hoffa. She continues with her music management career but before Elliott dies of natural causes, he asks Ann to promise him she will take his writing and add to it her own memories; memories of him as well as the Kohler Strike and her advertising war with the tobacco industry. More than two decades pass. Wherever she lived, Ann kept the essays hidden; sometimes in a bank vault, other times in her closet. She studied them, searching and hoping for flaws. She found none. Because of its historical content, she was torn between burning them or adding to them and releasing The Book. Although Eddie had remarried twice after he and Ann divorced; he is single and living alone in Santa Fe, New Mexico when he becomes critically ill. Without hesitation, Ann sells her Nashville home and business and moves to Santa Fe to care for him. After successfully helping Eddie recover his health, she keeps her promise to Elliott by releasing "The Book," and adding to it her own memories and memoirs. Acquista The Book in Epub: dopo aver letto l’ebook The Book di Grace Reinbold ti invitiamo a lasciarci una Recensione qui sotto: sarà utile agli utenti che non abbiano ancora letto questo libro e che vogliano avere delle opinioni altrui. L’opinione su di un libro è molto soggettiva e per questo leggere eventuali recensioni negative non ci dovrà frenare dall’acquisto, anzi dovrà spingerci ad acquistare il libro in fretta per poter dire la nostra ed eventualmente smentire quanto commentato da altri, contribuendo ad arricchire più possibile i commenti e dare sempre più spunti di confronto al pubblico online.